No where is the beauty of nature more magnificent than on the shores of a lake. The source of life for a variety and flora and fauna, the water in a quality lake becomes the perfect setting for picturesque days and nights. The diversity of lakes throughout the Midwest makes it easy to find property that can accommodate an owner's dreams. 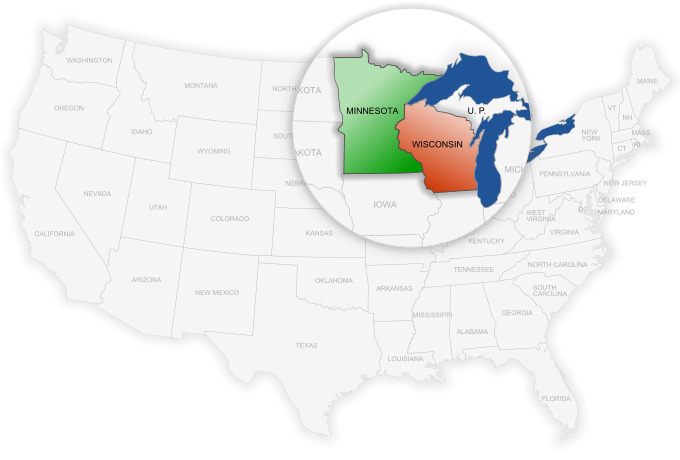 LakePlace.com makes it easy for you to locate your dream Minnesota lake property, Wisconsin lake property, Michigan lake property & North Dakota lake property. The decision to purchase lake property is not one to be taken lightly. The decline of available "unspoiled" lake properties is inversely proportionate to newer, restrictive attitudes about ownership. Before moving forward, there are a great many things to consider. Before searching for lake properties, one should ask themselves what they intend to get out of owning a piece of the shore. The Wisconsin Association of Lakes recommends that you ask yourself two questions before deciding to buy. (If you are searching in Minnesota, you will want to visit MinnesotaWaters.org). First, are you looking to get away from it all or to be conveniently located to Urban conveniences? Second, What activities do you plan on doing at the lake. The answer to the first question is an important one. People accustomed to the amenities in a larger urban area would do well to consider properties on popular lakes, such as Lake Mendota in Madison, Wisconsin. Lake Mendota's shores intersect with the bustling activities afforded to Madison. Similar lakes can be found throughout the Midwest. People who insist on making the jump from the urban life to a secluded getaway would do well to have an extended stay in those areas before considering purchase. City amenities such as garbage pickup will be significantly limited. Conversations with other local lake property owners may also highlight hidden discomforts. The kinds of activities performed on a lake will also greatly affect the outcome of choosing a lake. Lake Pepin, for example, it's a very large lake, with a lot of water skiing and commerce - not the ideal scenario for a quiet getaway! Lake Winnibigoshish in Minnesota, by contrast, provides little opportunity for high-speed water sports. Many lake have little to no access for swimming, while others will constantly buzz with the din of happy beachgoers. Be sure to know what kind of lake community to which you want to belong. The quality of a lake is only as good as the quality of the water in it. The quality of the water in a lake is ties to the quality of land around and - ultimately - to the lake home, cabin and lake lot owners. Certain types of lakes are naturally unfriendly environments for fish. Endoheric lakes lack an inlet or outlet, and often result in a lake with high salt content. Devils lake in North Dakota is one of these lakes. Research your development rights carefully. Be sure to know exactly where the high water line on the property is located, as most states regulate the construction of any new buildings based on that line. It's important to also understand floods, particularly if there's already a cabin or cottage on the lake lot. Frequent flooding may cause high insurance rates and consistent shoreline damage. Some older lake homes were constructed prior to lakeshore development regulations, which can make renovation plans trickier than usual - an older home may be located closer to the shore than any new structure can be built! Owning lakefront real estate is a responsibility. Even the most well-intentioned property owner can do damage to this unique, lakeshore ecosystem. For example, Wisconsin has seen a decrease in green frogs over the past decade, correlating directly to increased number of shoreline dwellings. Findings such as this have put pressure on the legislatures of many states to tighten development regulations. This means that buyers have to carefully research whether their plans for a lake property are in line with the local government as well as the local wildlife. Most states adhere to a "reasonable use" theory, which grants riparian (lake or riverfront land) owners the rights to use water in a way that does not interfere or damage the rights for other riparian owners. Most states do not allow you to own all of the water and - in some instances - easements may stipulate access to the lake for the public. In Wisconsin, the Public Trust Doctrine states that all waterways are public domain. While the public trust doctrine recognizes that riparian owners may build piers and docks - and claim ownership to the waters near their property, the State Supreme court has ruled that any conflicts between the riparian owner and the public will always favor the public. Minnesota's Department of Natural Resources (DNR) has a similar rules governing navigable waterways, but they do not lay claim to every body of water. The DNR in Minnesota publishes a map identifying which lakes are under the jurisdiction of the DNR and, thus, public. You may also want to try out the LakePlace.com Lake Finder to view lake maps and information for virtually every lake in Minnesota, Wisconsin, Michigan and North Dakota. Lake property - lake homes, cabins, cottages and lake lots - is a shift in ownership paradigms. In a traditional neighborhood, your neighbors are across the street - on a lake, they're one dock over, or on the other shore. Lakes are a special community that is built upon a mutual love for the shore. Its continued existence depends on homeowners who are dedicated to its preservation and, ultimately, to each other. A respect for the land will pay untold dividends in beauty for generations to come.